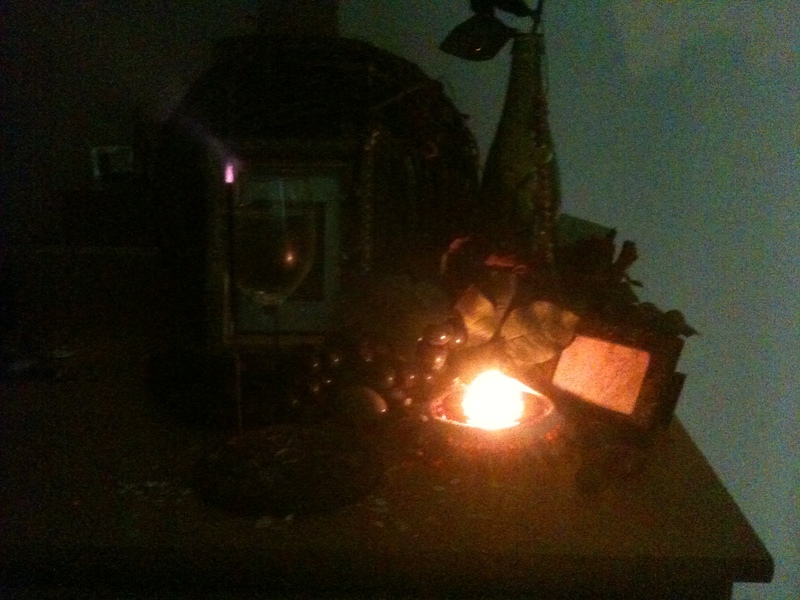 Here is an image of Dionysos’ shrine from a tiny ritual I conducted last night in his honor. The offerings are oats, incense, flame, and Riesling. The oats are an impromptu substitute for barley, which I do not have on hand at the moment. Never fear, I am fixing that. The incense is called Satyr and is made by Catherine, the lovely owner of Beads-N-Botanicals in Urbana. I really like that the burning incense tip is awake with Fire, so much so that you can see the blue-purple in the orange burn. It feels inspirited! The tealight has a similar animated character; in the picture it looks like a perfect orb of light, perhaps deposited on the altar by a nymph of Nysa :-D. The Riesling is lightly sweet and delicious, tasting of flowers. In addition to prayers and offerings at the shrine, I danced for Him (quite spontaneously), which I rarely do in a ritual context. For some reason, not only did it seem appropriate but downright necessary! With the stimulating prayers and rising spirit of the god himself, I felt compelled to arch and twist, to curve my back and whirl my head in spirals of delight. I enjoyed it, but at first I felt a little awkward. Me thinks He may wish a repeat performance, despite my reservations. And since my reservations are quite silly, rooted in fears and insecurities that He heartily laughs at, I will sate my lord’s desire for a dance every time he calls for one. This entry was posted in Divine Encounters, Ritual & Magical Energetics and tagged Altar, Dance, God Dionysos, Hellenic Ritual, Libations, Offerings, Shrine by Wandering Woman. Bookmark the permalink.